Myers Service And Distribution, Inc. Welcome to Myers Service & Distribution, Inc. Since 1989, we’ve been proudly providing Charlotte, NC with industrial painting equipment, as well as many other home painting services. We hope you choose Myers Service & Distribution for all your spraying needs! Is it time your home or business got a fresh coat of paint? Whatever your unique situation is, Myers Service & Distribution, Inc. can provide you with the tools and information you’ll need to get the job done. We’re happy to be the best place to find industrial spraying equipment in Charlotte, NC, and our staff’s combined experience of over 50 years in the painting business ensures that a visit to our shop will never be in vain. We love being able to offer industrial painting equipment in Charlotte, NC, and are able to put much more of our time and resources into helping each customer than a large chain supply shop would be able to. We look forward to counting you as one of our valued customers! We use and sell a wide variety of quality paint products, including: MiTM pressure washers; Graco, Tytan and SprayTech paint sprayers; and Wagner finishing equipment. Our knowledgeable and friendly staff has 50 years of combined experience. We’ve been a proud local business since 1989. 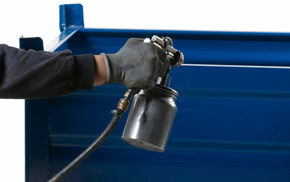 We can service and repair your equipment quickly and efficiently. For 25 years, Myers Service & Distribution, Inc. has been providing Charlotte, NC with quality paint sprayers as well as service and repairs.